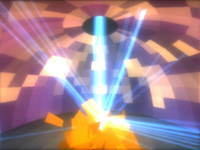 A tiny demo made for the 4 KB intro competition at the Assembly’2006 event. It is created by me and XMunkki, mostly during the event. It ended up at the 2nd place. Also thanks to st Rana for feedback during the development, as well as Ector and !Cube whose code can be found from the softsynth. Avast! Antivirus says “Windows zip” file contains some trojan, but source codes seems OK. Can I trust it? Yes you can trust it — no trojans in there. Sometimes anti-virus software misclassifies 4 or 64 KB intros as trojans or something like that. That happens because small intros have unusual tricks to fit more in the small space. Anything that is packed with kkrunchy will be detected as generic.trojan by every single antivirus out there. sometines demo get reported to antivirus vendros and they whitelist them after inspection. but very few demos have the honor. Andromedary was compressed using Crinkler 0.4a – but I guess crinkler-packed executables can get that same treatment from some antivirus software.